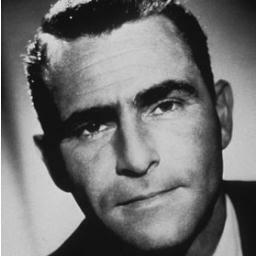 There is only one Mr. Serling, and that is Rod Serling. Forty years ago you left us sir, and our public consciousness never recovered from your sudden exit. This world and future generations will always remember you as the narrator and tour guide to the Twilight Zone, in which you revealed more about ourselves in the sixth dimension than in our own. Who could ever forget for five years the masterful display of human emotion, hubris and heartbreak wrapped up in a single half hour (then an hour in later seasons) showing the best of us, the worst of what we had to offer all but most of all reminding us how to be humane when others were not. You were not known for writing books, but your contributions into the world of the art are legendary and must be lauded. Mr. Serling, it is without a doubt rewarding after researching your journeys to the Twilight Zone before and after, how you used your marvelous gift of writing to convey tales sponsors and perhaps members of a 1950’s society didn’t want to hear. You showed us that within this ‘golden age’, there were cracks unchecked and societal issues that must be uncovered but did not have the opportunity to do so when the sponsors stopped you at every turn. How memorable would Playhouse 90 have been if they allowed you to write more of your planned Emmitt Till story rather than your teleplays Requiem for a Heavyweight and Patterns that convinced them your vision of storytelling could work, and an audience for it. Sir, I wish I could say our country and world has finally accomplished what would have been considered impossible; life in a country and world where there is absolute tolerance and the same nightmares and cautionary tales you penned did not come to pass. As an idealist as you were (and a great one at that) regrettably, there are plenty of Number 12’s who flood our airwaves and a contraption that I’m sure would have been of interest to you called the internet and the evolution of what we term social media. It has contributed to a variety of Monsters who live farther from Maple Street who are just as alive and dangerous than as we could ever have imagined. Our excesses and greed have caused us to poison children via vaccines, kill each other as we bow at the altar of the almighty dollar – these issues you spent your entire life protesting against, although it was intervention over a failed war that was your concern during your lifetime. It is unfortunate and disheartening Mr. Serling, that we’ve fallen into an age of conformity, where there’s a push for everyone to become the same. Did you not warn us of the danger of this? Did you not sound the alarm that our irrational fears manipulated by men who care not for the positive growth and development of mankind? I pray Mr. Serling that one day we as writers will challenge those fears deep within the chasms of our own hearts and like you, use our talents to convince future generations fear is not a viable solution for growth, but peace and understanding for all. I can say Mr. Serling, I observed a series of videos where you spoke to a group of whom I believe to be college students and shared your wisdom of the art and mechanics of the written word. Your passions on the permanency of the words we write were examined closely and it is my hope that in generations to come, future writers will begin to use their gifts to dissect the evils of mankind instead of letting their desires and lusts take control of their gifts. Mr. Serling, I live with a generation of writers whose voices are stifled, their tales compromised, visions cut short by the demands of a market with a lack of appetite for the substantive stories that engaged us through your travels in the Twilight Zone. You left us too soon Mr. Serling. Our generation needs more visionaries like you, who can help us tread carefully through the tricky depths of this wayward dimension. Until that time comes when we are motivated to expand our minds and hearts to absorb the morals of your tales and your efforts, we will be forever lost. We need you more than ever. You were gone too soon but hopefully within our generation there will be writers willing to throw down the gauntlet and show us the way. Thank you for giving us an idea and blueprint in which writers can use to write stories about issues that elevate the best of us, rather than promote the worst. Thank you so much.